In today’s chaotic world, we may sometimes feel that real humanity has become a distant memory from the past. But, like a bright rainbow after a rainy day, there are those whose acts of kindness replenish our hope. 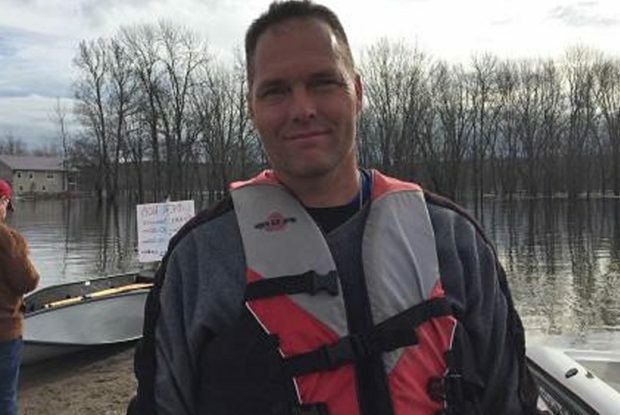 A man from New Brunswick, Canada is now being calling “Uber Rob” by locals for his heroic efforts in helping residents isolated by the province’s extreme flooding. 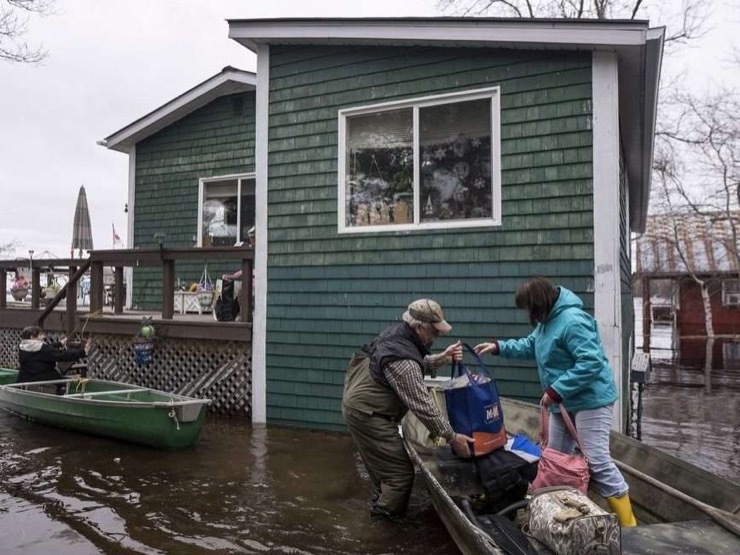 Record floods have brought chaos to a large swath of southern New Brunswick. 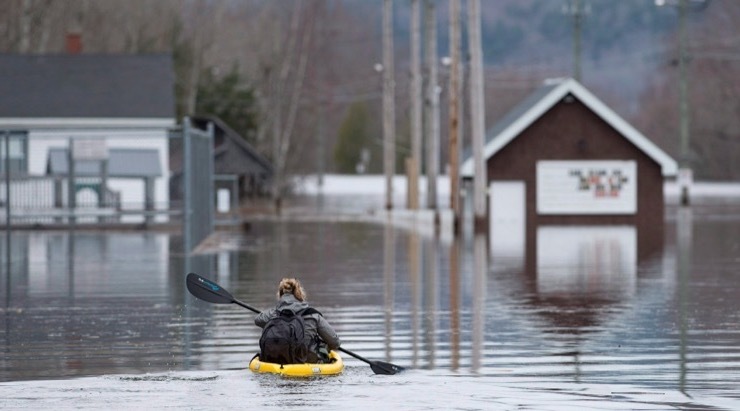 Key highways have been submerged in water, forcing many residents to evacuate. But, there are still many residents who were not able to evacuate in time, trapped in their homes, and having no place to go.. 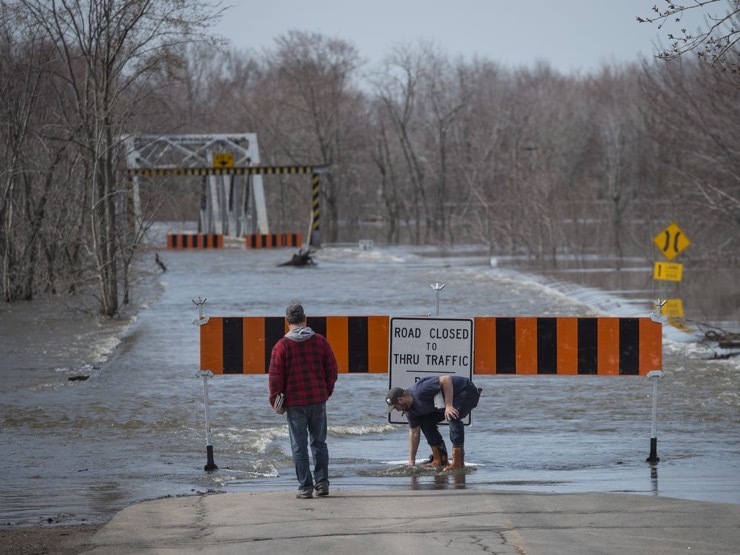 Residents of the small community, tucked between Nauwigewauk and Hampton in southern New Brunswick, have been cut off from the mainland for days. 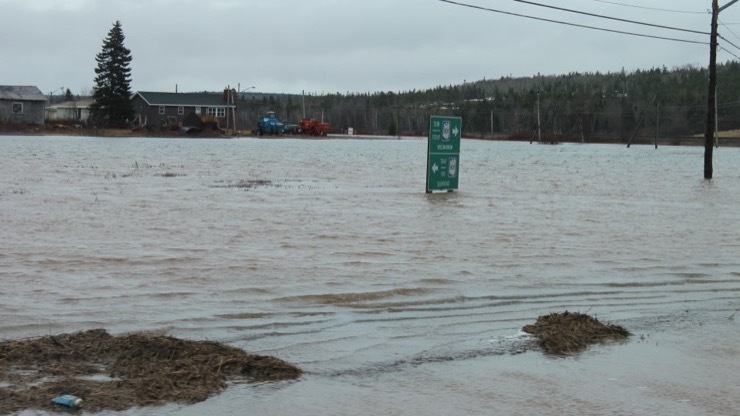 Floodwaters have submerged all the roads to the mainland, making it impassable for vehicles. 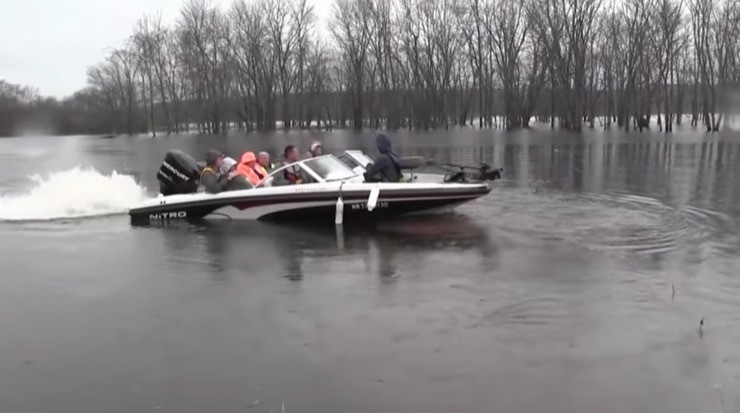 The water level has reached 5.4 feet and it doesn’t stop there. 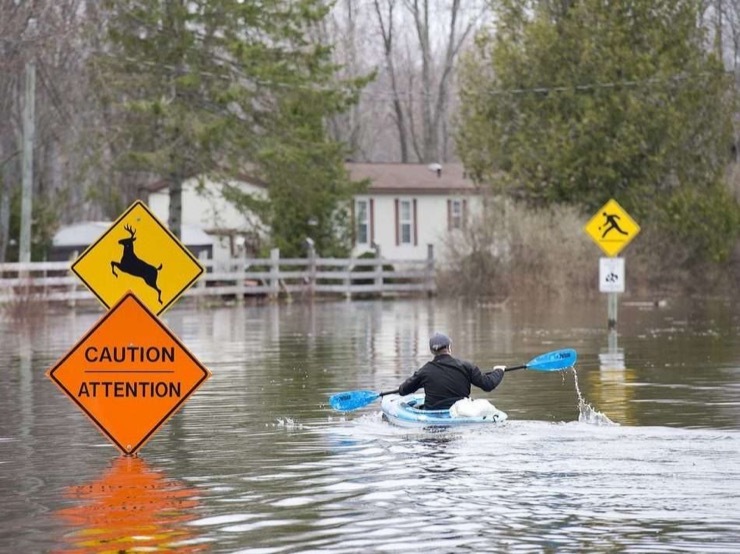 Emergency officials predict the river will continue to rise from the unforgivable rain, producing record-breaking levels of about six feet by Sunday. It’s up to residents to find their own way to work, school, and medical appointments. 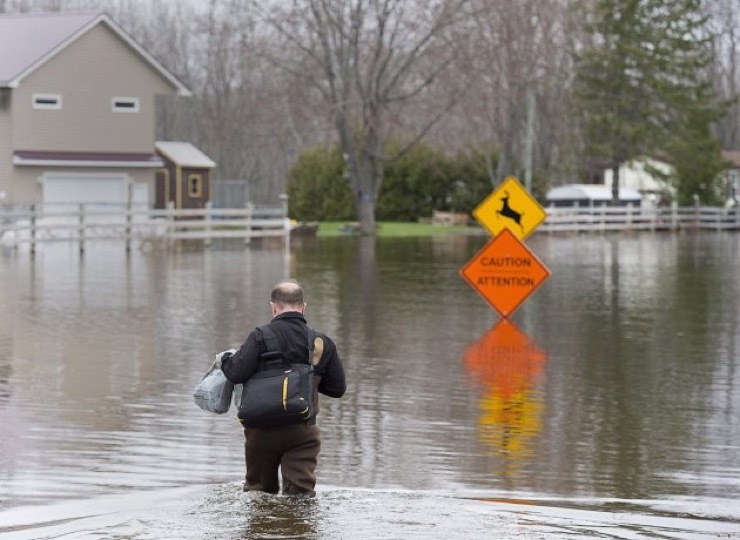 But, the effects of the flooding have caused greater impact on the local senior citizen population, who have not had any access to medication vital to their well being. 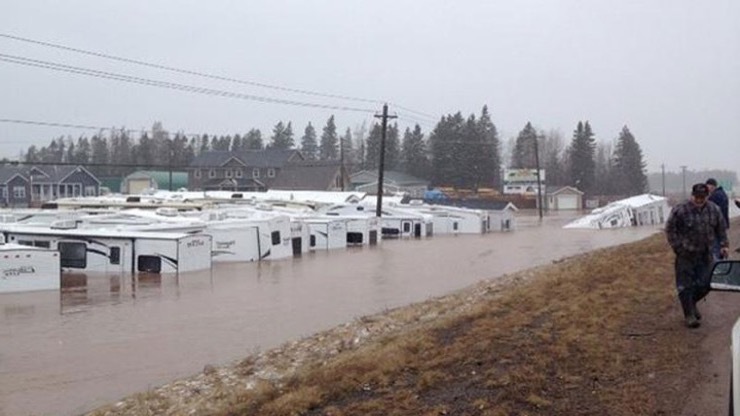 And with more rain predicted in the upcoming days, residents of the small town felt abandoned and helpless. It is becoming more challenging as the water level goes up, bringing it more because of debris from people’s yards. 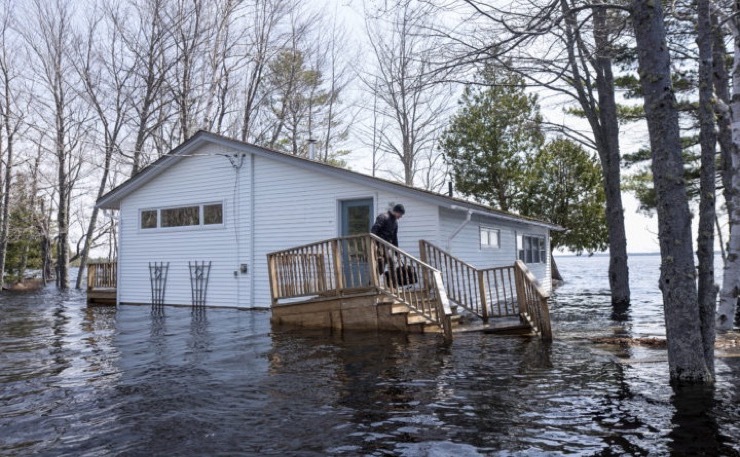 “I literally saw the kitchen sink floating by me,” one resident says, “I’m seeing couches, logs, rafters from houses, you name it, it’s out there and it’s just like going through the Everglades”. 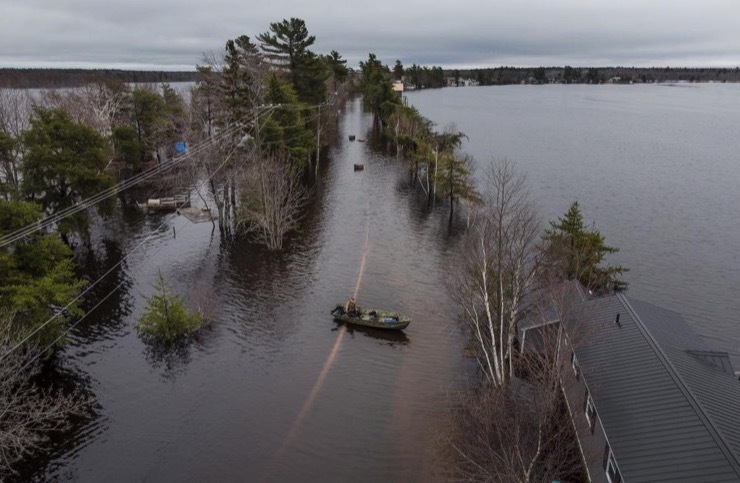 The flood waters have deposited all sorts of debris, including logs, wood, and even propane tanks, creating an extremely unsafe and dire situation for the residents. 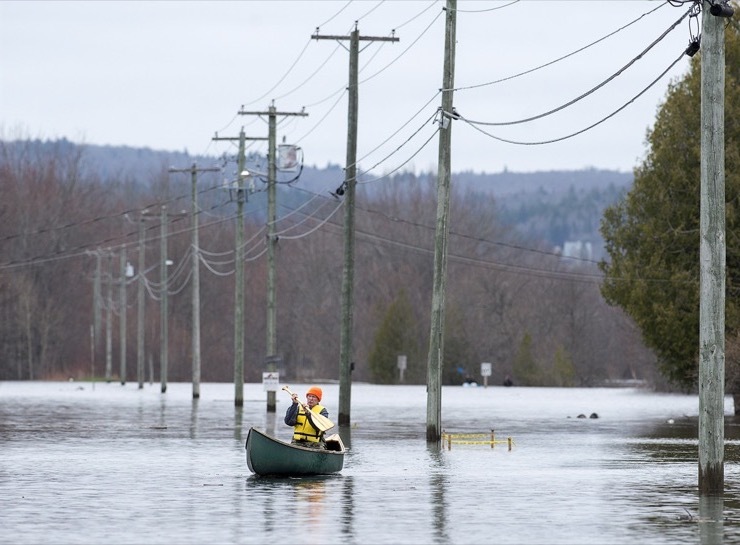 “The water is dirty, absolutely,” said Greg MacCallum, director of the province’s Emergency Measures Organization. Rob has made the trip a few times an hour to get people off the island in the mornings, then returning them each afternoon and evening. Rob said the profits he makes from a lucrative worm business allow him to give back to the community. 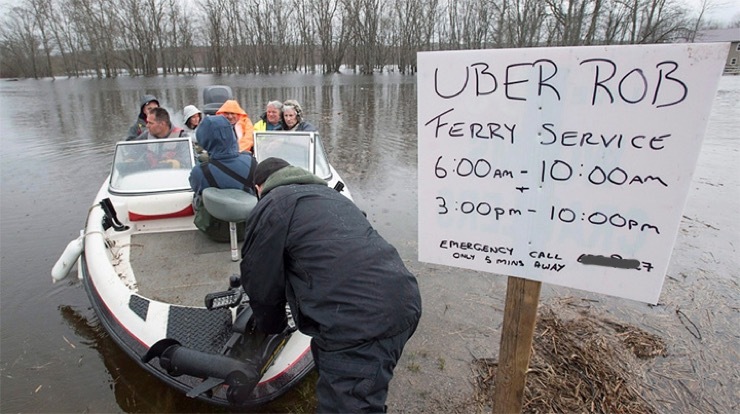 There’s even a schedule posted on a makeshift “Uber Rob” sign at the edge of the water. He has taken time off from his job and assigned himself two shifts per day. Today, he will start his river run at 5:45 a.m., until 10 a.m., and then again from about 3 p.m. to 10 p.m.
“He’s our saviour,” Patty Johnston said as she stood in the rain, waiting to cross choppy, debris-filled waters to get to her home. 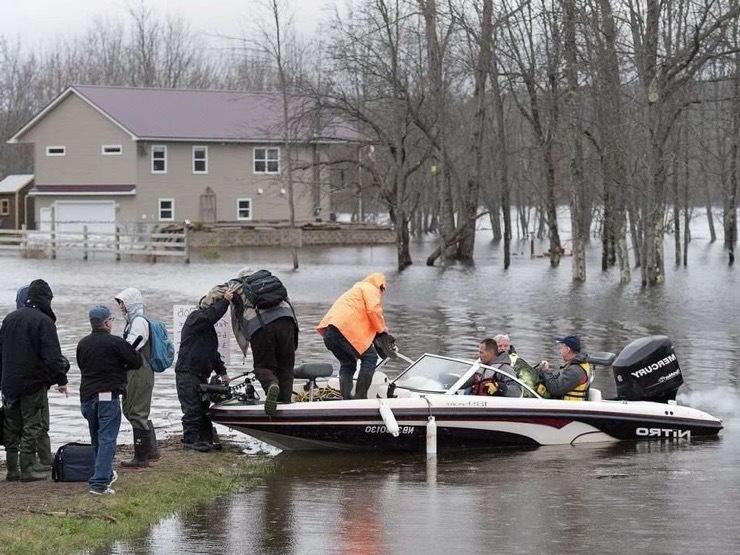 After days without access to food and water, residents finally had the opportunity to go back and forth from the mainland to their homes. 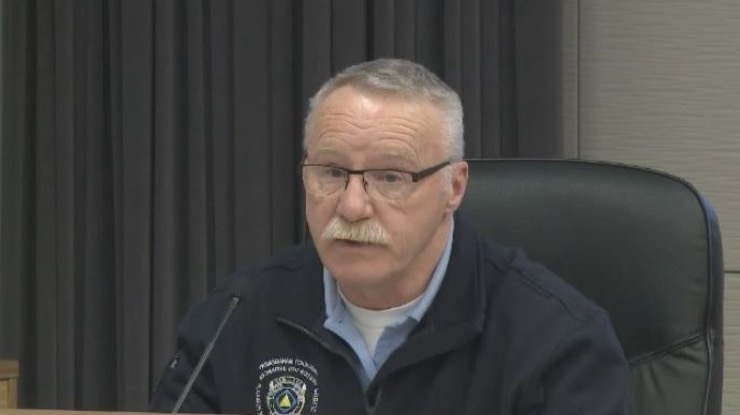 Rob Dekany estimates he transported about 40 people on Monday night alone and had a steady stream of passengers on Tuesday, including a woman in her 80s who had to go to the Saint John Regional Hospital that night. 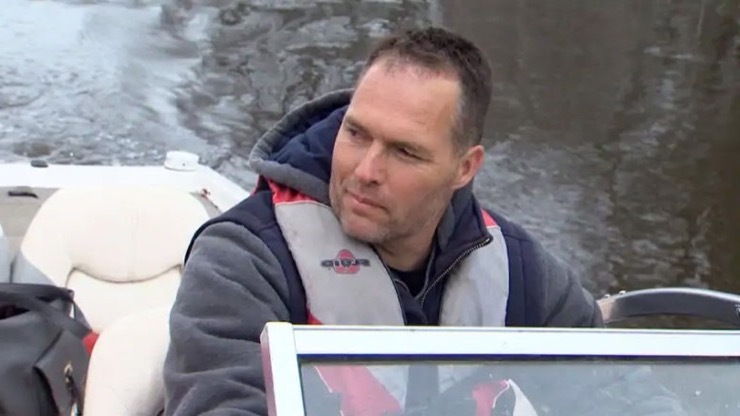 Rob can take up to five passengers at a time in his 150-horsepower boat and greets them with a friendly, “How you doin’?” He even supplies life-jackets…. 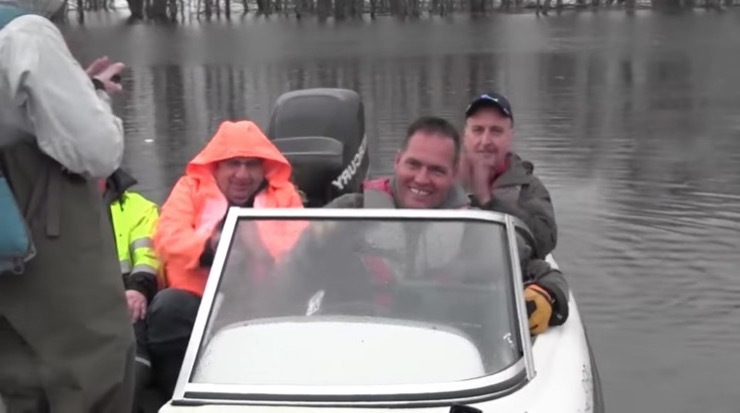 “He is an absolute godsend to us, we’re so thankful for his selfless help,” says Tasha Dawn. Tasha is the passenger who suggested taking up a community collection for a gas gift card for Rob after he refused to accept any money. “Boats are hard on gas, and with the number of trips back and forth this is surely going to be expensive for him,” Dawn posted on the Darlings Island Facebook group.